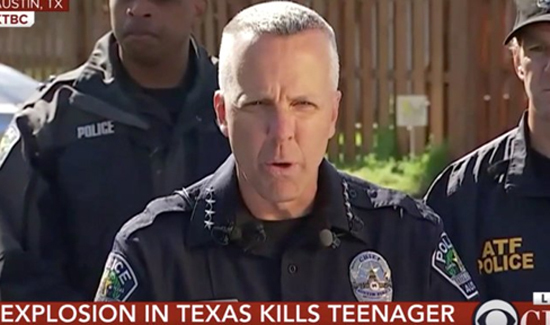 In Austin, Texas, police say they believe a serial bomber is behind three recent explosions that have killed at least two and wounded several others. All of the people targeted have been African-American or Hispanic. One would think that IED fatalities targeting civilians on US soil might be a big story but for whatever reasons it hasn’t garnered as much media interest as other stuff. Police Chief Brian Manley said investigators believe the two bombings Monday are related to a March 2 attack that killed a 39-year-old man. “This is the third in what we believe to be related incidents over the past 10 days,” Manley said while briefing reporters near the site of Monday’s second explosion. Manley suggested that the attacks look like hate crimes but then tried to walk that back some saying detectives aren’t ruling anything out.